MOORESVILLE, N.C. (Dec. 23, 2016) – Kyle Busch Motorsports (KBM) announced today that Myatt Snider will compete in eight NASCAR Camping World Truck Series races in 2017 with primary sponsorship from Southeastern Mills and its Louisiana Hot Sauce brand. Snider will make his KBM debut behind the wheel of the No. 51 Louisiana Hot Sauce Tundra in the Truck Series season opener at Daytona (Fla.) International Speedway Feb. 24. The 22-year-old is also scheduled to compete at Texas Motor Speedway in Fort Worth June 9 and Nov. 3, Kentucky Speedway in Sparta July 6, Chicagoland Speedway in Joliet, Ill., Sept. 15, Las Vegas (Nev.) Motor Speedway Sept. 30, Talladega (Ala.) Superspeedway Oct. 14 and Homestead-Miami (Fla.) Speedway Nov. 17. Snider put his name on the national motorsports map in May of 2016 when he led 35 laps en route to victory in his ARCA Racing Series debut at Toledo (Ohio) Speedway. The North Carolina native collected one win, 68 laps led, three top-five and five top-10 finishes resulting in an average finish of 13.8 across nine ARCA starts this season. 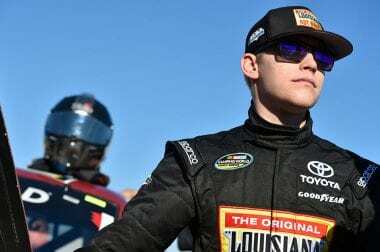 He made his NASCAR Camping World Truck Series debut for AM Racing at Phoenix International Raceway in November where he started 19th and finished on the lead lap in the 17th spot. “We look forward to continuing our partnership with Myatt Snider as he joins Kyle Busch Motorsports’ driver lineup for the 2017 NASCAR Camping World Truck Series season, and we are excited to have Louisiana Hot Sauce on the hood of the No. 51 Toyota for the season opener at Daytona International Speedway,” said Brad Olsen, Senior Director of Marketing for Southeastern Mills. Southeastern Mills is a fourth generation, professionally managed food company headquartered in Rome, Georgia. Southeastern Mills serves the world’s largest grocers, restaurants and food manufacturers across North America. The company markets multiple national consumer brands including Better Than Bouillon®, Louisiana Hot Sauce®, Southeastern Mills®, Shore Lunch®, Better Than Gravy®, and Crockery Gourmet®. For more information, please visit www.betterthanbouillon.com, www.louisiana-brand.com, www.semills.com, and www.shorelunch.com to learn more.